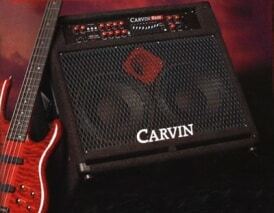 In 1999 Carvin made a bold follow-up and delivered the bass guitarworld the R600 bass amp series. The Carvn R600 featured a “mono bridge” output switch that delivers a thundering 600-watts from the amp’s 2 x 300-watt amplifier. The hefty power comes courtesy of Carvin’s HT (High-Energy Transfer) power module, which can also be split for bi-amping at any crossover frequency between 200hz and 2khz. Other refinements to the original R600 series include three levels of EQ and a blend-able tube/solid-state input for a wide range of tonal variations, as well as a foot-switchable effects loop, an XLR direct out with ground life, and three preamp outputs. 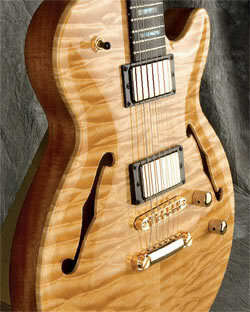 *The Carvin R600 Redline series is no longer in production. New for 1999 was the RC210 Red Eye Combo (pictured). 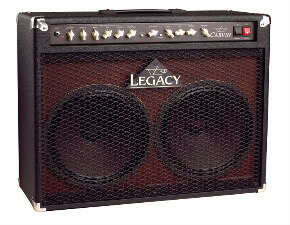 This was a tiltback combo amp, based on the Series II Red Line amps. This 600W combo had all the features of the R600 head, in an ultra-compact package with a pair of 10″ speakers and the Red Eye horn. The RC210 sold for $749.95, and was also available as the RC210-18, which included the RL118 extension cabinet. Sold for $1049.95. 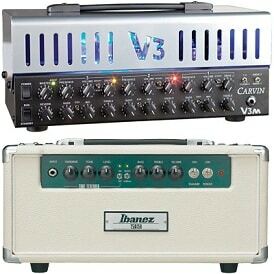 Winter NAMM 2009 is coming up, January 15th to be exact, Carvin Guitars will be unveiling the all-new Steve Vai Legacy II Series amplifiers.